●Heat stroke is defined as an elevated core temperature ≥40 to 41°C (104 to 105.8°F) accompanied by central nervous system (CNS) dysfunction in children with environmental heat exposure. This condition represents a failure of the body's ability to maintain thermoregulatory homeostasis and is a true medical emergency. ●Rectal or other core body temperature measurement (eg, esophageal, bladder, or central venous temperature) is typically ≥40°C (104°F) in children with heat stroke. However, the clinician should consider the possibility that prehospital cooling efforts have potentially lowered core body temperature prior to hospital assessment when making the diagnosis. ●CNS symptoms may be subtle and can manifest as impaired judgment or inappropriate behavior. However, children commonly present with more significant neurologic symptoms such as seizures, delirium, hallucinations, ataxia, dysarthria, or coma. Other common clinical features include tachycardia, tachypnea, and hypotension. The skin may be flushed and warm (classic nonexertional heat stroke) or diaphoretic (exertional heat stroke). Vomiting and diarrhea are also common. In addition, those patients with coagulopathy may demonstrate purpura, hemoptysis, hematemesis, melena, or hematochezia. ●Children with heat stroke have abnormal laboratory findings, reflecting the systemic inflammatory response and end-organ damage resulting from heat stress. These patients warrant extensive studies to detect the presence of hypoglycemia, metabolic acidosis, anemia, disseminated intravascular coagulation, electrolyte disturbance, liver injury, prerenal azotemia, rhabdomyolysis, and exposure to illicit drugs or other toxins associated with hyperthermia. ●The diagnosis of heat stroke is made on the basis of clinical findings. The full differential diagnosis of hyperthermia should be considered in each patient. 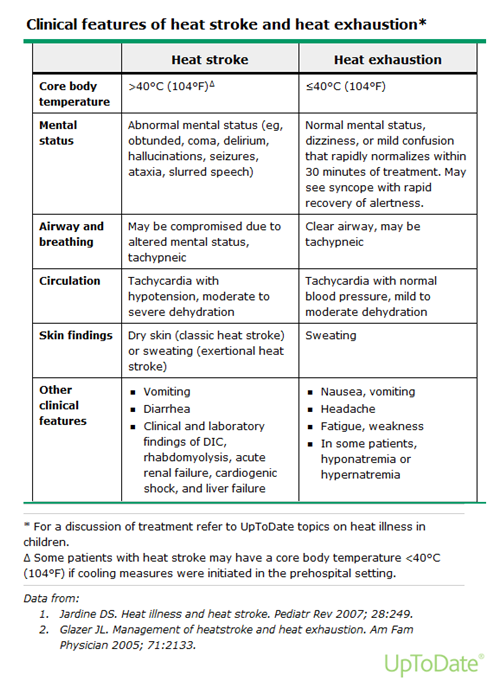 In addition, there is some overlap of symptoms between heat exhaustion and heat stroke (table 3). While the distinction between heat exhaustion and heat stroke is sometimes unclear, children with elevated body temperature and CNS abnormalities should be treated as victims of heat stroke. ●We suggest that children with heat stroke undergo treatment with either ice water immersion (if equipment and trained personnel are immediately available for initiation of this technique) or evaporative external cooling in the field. Prehospital cooling measure should be initiated prior to, or simultaneously with, activation of emergency medical services (Grade 2C). ●Children with heat stroke frequently require basic and/or advanced airway management to maintain oxygenation and ventilation because of central nervous system effects (eg, coma, seizures). ●Fluid resuscitation depends on the type of heat stroke and should seek to replenish intravascular volume while avoiding fluid overload. Patients unresponsive or minimally responsive to fluid resuscitation should undergo central venous pressure monitoring to guide additional therapy. Children with heat stroke often have decreased cardiac contractility and systemic vascular resistance as a byproduct of the heat stress and require initiation of vasopressor therapy to maintain adequate tissue perfusion. ●Children with heat stroke need to be treated aggressively, because the extent of end-organ damage is related to the duration of hyperthermia. We suggest that children with heat stroke undergo treatment with evaporative external cooling (Grade 2C). Application of ice packs to the neck, axilla, and groin and administration of room temperature intravenous normal saline may complement evaporative cooling efforts. Cooling measures should be stopped in pediatric heat stroke victims once the core temperature reaches 38ºC (100.4ºF) to prevent overshoot hypothermia. ●We suggest that patients with heat stroke receive benzodiazepines (eg, midazolam 0.05 to 0.1 mg/kg intravenously) to prevent shivering during cooling measures (Grade 2C). ●In addition to rapid cooling and careful assessment and support of airway, breathing, and circulation, the clinician should anticipate and aggressively manage dehydration, rhabdomyolysis, disseminated intravascular coagulation, high output cardiac insufficiency, renal failure, and hepatic failure. ●All children with heat stroke should be admitted to a pediatric critical care unit setting in order to maintain appropriate monitoring and to treat ongoing and delayed end-organ dysfunction. If there is no pediatric critical care coverage at the admitting hospital, the child should be resuscitated and promptly transferred to an appropriate institution. Rapid cooling — Children with heat stroke need to be treated aggressively, since the extent of end-organ damage is related to the duration of hyperthermia. No trials have compared cooling methods in children with either classic (nonexertional) or exertional heat stroke. The following recommendations are based on small trials and observational series performed in adult populations. Most studies have evaluated the impact of various types of cooling on the lowering of core body temperature in patients with exertional heat stroke. ●External cooling – We suggest that children with heat stroke undergo treatment with evaporative cooling. Application of ice packs to the neck, axilla, and groin and administration of room temperature intravenous normal saline may complement evaporative cooling efforts. Cooling measures should be stopped in pediatric heat stroke victims once the core temperature reaches 38°C (100.4°F) to prevent overshoot hypothermia. Although cold water immersion has been demonstrated to more rapidly cool core body temperature in young healthy adults with exercise-induced hyperthermia greater than 38.5°C (101.3°F), it is associated with significant discomfort, shivering, agitation, and combativeness in vulnerable populations, such as the elderly and, theoretically, may be more likely to cause overshoot hypothermia and bradycardia in children. Cold water immersion also hampers efforts to maintain monitoring and ongoing resuscitation in these unstable patients. In addition, no research has demonstrated superior outcomes for adult patients undergoing cold water immersion despite the more rapid drop in core body temperatures achieved with this method . Although a systematic review suggests that ice-water immersion of exercise-induced hyperthermia >38.5°C (101.3°F) has the fastest cooling rate and is efficacious for exertional heat stroke (core temperature ≥40°C [104°F]), our view is that safety and efficacy for cold water immersion in exertional heat stroke is not established given that much of the data appears to be drawn from patients with heat exhaustion, not heat stroke. Isopropyl alcohol baths may lead to dermal absorption with toxicity in children and should be avoided. •Evaporative cooling – Evaporative cooling is achieved by spraying patients with tepid water (to minimize shivering) while fanning with high-flow fans to maximize air circulation. Cooling rates approaching 0.15°C per minute (0.27°F per minute) have been achieved in adults. Both spray bottles and fans are usually available from hospital housekeeping services. Suspension of the patient on a mesh hammock during treatment enhances air circulation and may increase the rate of cooling. Alternatively, the patient may be placed on a cooling blanket to enhance conductive cooling. If tolerated, selective application of ice packs to the neck, axillae, and groin during evaporative cooling may be of additional benefit. •Cold water immersion – Cold water immersion is another adjunctive cooling modality when evaporative cooling with or without selective ice application is not possible. It remains unclear whether the inherent impediments of immersion to safe monitoring and resuscitation in the hospital outweigh the putative benefits. •Other methods – In adults, cooling methods such as cooling blankets alone, covering patients in ice, covering patients with a wet sheet while fanning, or selective application of ice packs to the neck, axillae, and groin have very low to negligible cooling effect. However, cooling blankets with ice packs have been an effective form of total body cooling in infants after cardiac arrest and might achieve rapid cooling in a small infant. If used, neuromuscular blockade or sedation may be necessary to prevent shivering. ●Internal cooling – The most effective method of lowering the core body temperature quickly is the use of cardiopulmonary bypass; however, this highly specialized intervention is not rapidly available at most institutions. Newer, less invasive devices such as intravascular cooling catheters have been utilized to rapidly induce therapeutic hypothermia in order to treat or prevent neurologic injury in victims of cardiac arrest and may be useful in cooling efforts, although their effect has not been studied in heat stroke victims. Similarly, intravenous (IV) infusion of chilled normal saline via peripheral lines has been advocated although little data exist regarding its efficacy. Gastric, rectal, and/or bladder lavage with cold isotonic fluids (eg, normal saline that has been iced) have been proposed as additional means of invasive cooling. However, it is not clear that these methods are any more effective than evaporative cooling or cold water immersion alone. For example, in canine studies, iced gastric lavage was inferior to evaporative cooling, while iced peritoneal lavage was equivalen. Thus, these methods are not routinely employed. Decreases in core body temperature as measured by rectal temperature generally lag behind the actual drop in core temperature at the hypothalamus. For this reason, cooling measures are generally stopped in pediatric heat stroke victims once the core temperature reaches approximately 38°C (100.4°F) to prevent overshoot hypothermia. The amount of time required to reach this endpoint depends on the patient's initial temperature and the mode of cooling. Medications have a limited role in the management of heat stroke. However, pharmacologic measures taken to prevent shivering in heat stroke patients undergoing cooling may prevent increased endogenous heat production. The majority of studies investigating the use of medications to treat shivering have been conducted in perioperative settings, and no controlled studies have been conducted in patients with heat illness. We suggest that patients with heat stroke receive benzodiazepines (eg, midazolam 0.05 to 0.1 mg/kg intravenously) to prevent shivering during cooling measures. Benzodiazepines have the added benefit of treating or preventing seizures. Although antipsychotic agents (eg, chlorpromazine) have been used in adults to prevent shivering, their alpha-1 blocking properties may exacerbate hypotension in heat stroke victims. They also have a greater propensity to cause dystonia in children. Thus, they should be avoided. Dantrolene, a nonspecific skeletal muscle relaxant that acts by blocking the release of calcium from the sarcoplasmic reticulum, is used for the treatment of malignant hyperthermia and was once proposed as a treatment for hyperthermia from heat stroke. Although initial evidence suggested that dantrolene shortened cooling times in adults with heat stroke, additional small trials have not identified a consistent benefit. Thus, dantrolene is not routinely used. Some experts advocate the use of dantrolene in patients who are not responsive or are poorly responsive to initial cooling efforts.